To start your Laser Hair Removal treatments, book your free consultation appointment today. Call 289 350 0321 or send us an email using Quick Contact form on this page. Dermeo MDFLASH4 is a new generation of IPL Laser Hair Removal system. This advanced system is the result of latest technological innovations. MDFLASH4 delivers evenly distributed energy over the entire treatment area. Only a single blast of flash is necessary for permanent results. Our technologically advanced Intense Pulsed Light IPL Laser Hair Removal system successfully removes unwanted hair from a wide range of skin tones. So regardless of your skin colour, feel free to book your first consultation appointment. We guarantee the results. We guarantee that after the completion of your prescribed treatment, you will see drastic reduction in hair on the treated areas. If hair ever comes back, any additional treatments will be at no cost to you. IPL stands for Intense Pulse Light. This technology has been proven to successfully remove unwanted hair. New technological breakthroughs have made IPL the ideal choice for effectively removing hair from a wide range of skin tones – from very light to very dark. Dermeo IPL MDFLASH4 is at the cutting edge of IPL technology. The system is fully designed and manufactured in France and boasts impressive and lasting results. 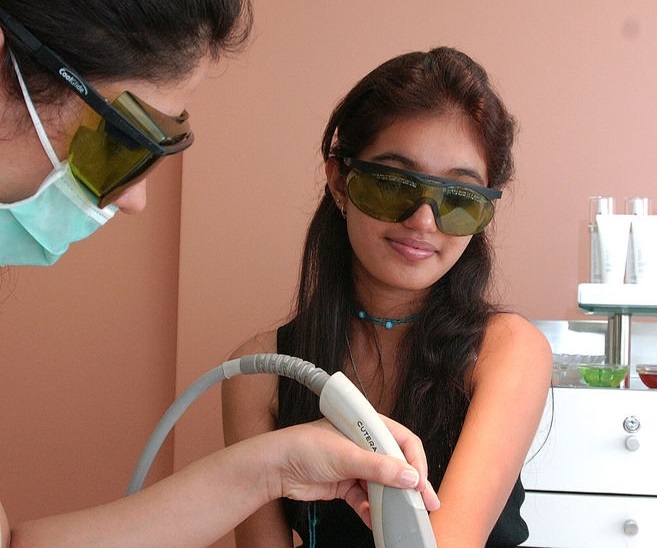 Why Use IPL for Hair Removal? There are many ways to remove unwanted hair. Examples include waxing, shaving and plucking. But all these methods remove hair only temporarily. With these methods, the hair follicle stays unharmed. Some of these methods may even stimulate the follicle thus leading to increased and stronger hair growth. IPL hair removal technology works to destroy the follicle itself. This leads to lasting results. The IPL hair removal treatment is safe, gentle and pain free. How does Dermeo MDFLASH4 IPL System Work? The IPL system produces a burst of light energy of a specific wavelength range. This energy is applied to the skin. The energy is absorbed by hair follicles located just below the skin. The skin itself stays cool with the help of a cooling gel throughout this process. As a result of soaking up the light energy, hair follicles are destroyed. They are no longer capable of growing hair. How is IPL Laser Hair Removal Different from Traditional Laser Hair Removal? Traditional Laser systems use a single light wavelength concentration. On the other had, Dermeo MDFLASH4 Laser Hair Removal system uses a wider spectrum of light wavelengths to target unwanted hair in a much wider range of skin tones. IPL Laser Hair Removal has become the method of choice for many. The major reason cited is its effectiveness in removing unwanted hair. Results are impressive. And it doesn’t stop there. IPL treatments cost a lot less than traditional laser treatments. Dermeo MDFLASH4 Laser Hair Removal system treats larger skin patches with each burst of light. This allows larger areas such as legs and back to be treated in a fraction of the time required by traditional lasers. This results in reduced cost for the client.